The most influential film director in my life isn’t Sergei Eisenstein or John M. Ford or Orson Welles. It’s Hollywood director John Hughes, who died this week at the age of 59. The day after I saw The Breakfast Club in the theater I stayed home from school. My mother was a little alarmed at how upset I was by the movie and decided not to press the issue. That’s the moment, right there in the darkened Parkway Cinema in Natchitoches, that I first realized how seriously I was depressed. Yes Hughes’s movies were calculated Hollywood comedy, but those stories about the hopes and insecurities of high school kids in Shermer, Illinois were real to me, real in a way that I wasn’t seeing anywhere else in film or television. Gen Xers will be posting plenty of blog entries about Hughes over the next couple of days. Rather than dwell further on his contributions to our generation’s psyche, I’m going to take a slightly different tack. In case anyone significantly younger than me is reading this, I want to pay tribute to one part of Mr. Hughes’s legacy that might not be obvious from watching these films on DVD: the construction of the soundtrack. 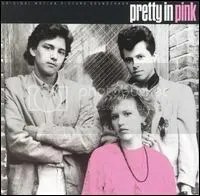 The title of Pretty In Pink was inspired by the Psychedelic Furs song of course, but look at all the other songs here: Suzanne Vega’s “Left of Center” (for years this was the only place to find the song), “If You Leave” by OMD, Echo and the Bunnymen’s “Bring On the Dancing Horses,” and the Smiths’ great ode to adolescent desperation “Please Please Please Let Me Get What I Want.” Some of these songs feature prominently in the film, but some are just playing in the background. OK, what’s surprising about that? Everything. That’s not how soundtracks were made in 1986. For most of the history of talking film, a good film score might well be released on vinyl, but if a song was going to be associated with a movie (aside from musicals) it would be ONE song, specially commissioned by the studio in hopes of getting a hit. Hughes paid more attention to incidental pop music in film than anyone before him, carefully picking little-known songs to highlight scenes and being sure to secure the rights to release them on a soundtrack compilation. It’s the beginning of the film soundtrack as we know it today. This entry was posted in Uncategorized and tagged film, music, personal. And I have no doubt that Hughes soundtracks gave a good nudge to my interest in “new wave”, “progressive” or whatever you call that flavor of stuff. Still love it. I got chills just reading this. Thank you *again* for putting into words what I could only emote.